(1) Vali, G. et al. 2002. Wanted more PhDs: Graduate Enrollments in the Atmospheric Sciences, Bulletin of the American Meteorological Society, 83:63-71. (2) Pielke, Jr., R.A., 2003. Supply and Demand for Atmospheric Science Professionals, Bulletin of the American Meteorological Society 84:170-173. (3) Vali, G. and R. Anthes, 2003. 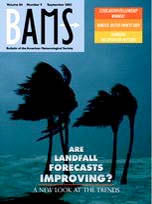 On the "Supply and Demand for Atmospheric Sciences Professionals", Bulletin of the American Meteorological Society, Vol. 84:1163-116. (4) Pielke, Jr., R.A., 2003. Supply and Demand for Atmospheric Sciences Professionals: A Rejoinder to Vali and Anthes, Bulletin of the American Meteorological Society, 84:1164-1165.